For the past year, I’ve seen photos and stories about people and their bucket lists. They’ve been around longer than a year, but I’ve really noticed an increase in them this past year. Maybe because they’re making the rounds on social media. I’ve even seen some create bucket lists for their pets. Women post selfies in front of the Eiffel Tower, sometimes with a small dog licking the camera. I guess I understand our fascination with them. We want to squeeze everything we can out of life. See all there is to see. It’s a big world, after all, and even if we achieved everything on our lists, we’d still only experience maybe a 10th of what life has to offer. What I don’t understand is how so many people can have such high-priced items on their list, or defy death in various ways. Perhaps I’m a pessimist, but I don’t think racking up a bunch of frequent flier miles will give me a deeper sense of meaning to life. Not to say that I don’t enjoy traveling. Visiting another culture creates opportunities to enrich us, but traveling to places so you can mark them off a checklist as if to say, ‘I did it! I’ve been there!’, doesn’t. And I have to believe there are millions of folks out there who can’t afford to hop on a plane and visit 37 countries. Or swim with dolphins. Or go skydiving. I know we all have different ideas of what’s meaningful. For some folks, it might be standing in front of the Eiffel Tower, while others might want to connect with nature. And though I’d love to visit Greece or Italy, traveling in and out of airports doesn’t resonate with me. Then there are other things I wouldn’t put on my list because they aren’t necessary. I already volunteer. I do spend time with children. I do fly kites. I have fantastic hobbies that bring me immense satisfaction. I’ve been on an old medieval cog in the sea. I’m already in love. I have visited another country. I have lived in another country for more than six months. I do pray for people. I have learned a new language. I have no desire to tempt death. I hate heights and can see no reason why people should jump out of an airplane–ever. 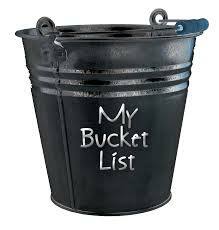 I also don’t think a bucket list should be a list of goals. Those are separate. Otherwise, how would you know which goals to put on the bucket list? Do you get to put little goals on there, like ‘get family photos on the wall’? Or is it just big ones, like, ‘lose twenty pounds’? I would want to keep the two separate. Goals go on a different list. They’re worthy, but not made of the same stuff as bucket-list items. I would love to own a home, but I think that’s a goal and not a bucket list item. In other words, if the doctors told me I had a year to live, I wouldn’t go out and take out a loan to buy a home. See the northern lights. (I happen to live in Sweden, so this is entirely possible. The only problem is most of the northern lights show up during the summer, and if you’ve ever been to Sweden you’ll know the sun doesn’t really set during the summer. But I keep hoping I’ll see them during the winter!). Write a letter to my children telling them how funny, and loving, and compassionate, and full of possibilities they are. Make a bow and arrows. Then test them. Sit in front of a fire with a book, someone I love, and not worry about anything. Find the perfect quiet space. Pick apples from an orchard. Enjoy a meal with someone totally unexpected. Next Article Coffee or Tea?